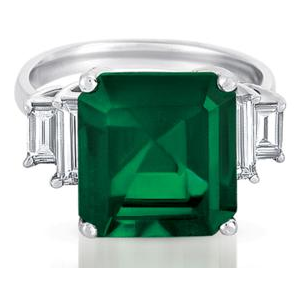 The most prized of all green colored gemstones is the emerald. Emerald, aquamarine and morganite are members of the beryl family. The beryl family is composed of minerals whose primary composition is beryllium-aluminum silicate. Traces elements result in the color we observe. In the case of emerald the color is due to chromium or vanadium oxides. Emerald is the birthstone for the month of May. Emerald were dedicated the the goddess Venus. Lovers were told that the gemstone was endowed with the power to reveal the faithfulness of a loved one. Others believed the gemstone provided the owner a supernatural ability to foretell the future. The emperor Nero would "refresh and restore his vision" by viewing events through the cool color of an emerald. The most desired color is a deep green. Most emeralds are clouded by bubbles, cracks or foreign crystals. These inclusions are evidence of natural origin. 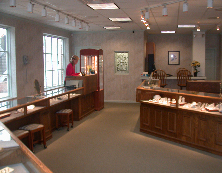 Color in the gemstone is often concentrated in spots or bands. A deep green, heavily included stone is generally more valuable the a pale crystal with few inclusions. Emeralds have been found in Africa, India, Pakistan, Australia, South American and in the U.S. in North Carolina and Maine. The most import deposit are those found in Columbia. Several interesting emeralds are located at the Smithsonian Institute. These include a 300 year old Inquisition Necklace from Gachala, Columbia and a 3.82 carat faceted gemstone.